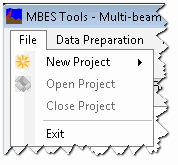 The File Menu provides a means to create and open projects within MBES Tools. Unlike GCD, projects are not required in MBES Tools. In MBES Tools version 0.1, projects are not currently supported. However, in later releases we plan to provide an optional project structure that enforces consistent naming, file and folder management conventions, as well as makes it easier to track the analyses done for a particular project. We intend to allow the user the flexibility to access most of the MBES Tools without being in an MBES project, but we will then make it easier for the user when they use a project, by auto-populating forms and forcing the outputs to consistent locations.